C.C. Little Science Building. 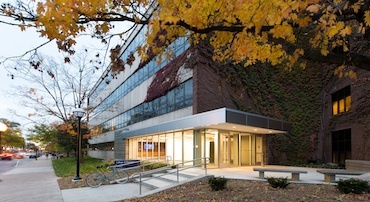 College of Pharmacy classrooms, undergraduate laboratories, certain graduate and research laboratories, and some faculty offices are located in the Clarence Cook (C.C.) Little Science Building, adjoining the Pharmacy Building. College of Pharmacy Building. The general office, counseling offices, some faculty offices, and certain graduate and research laboratories of the College are located in the Pharmacy Building. Charles R. Walgreen Jr. Laboratory. The Charles R. Walgreen Jr. Laboratory is used for teaching patient counseling, learning compounding and dispensing techniques for prescription medications, and acquiring skills related to the creation of basic IV admixtures. Pharmaceutical Analysis Laboratory. The pharmaceutical analysis laboratory, replete with balance and instrument rooms, is equipped with the special instruments and apparatus essential to an efficient analytical laboratory. Nuclear Pharmacy Laboratories. Facilities at the University Nuclear Reactor, and in the Nuclear Medicine Division of University Hospitals, are used for producing and dispensing radiopharmaceuticals. Graduate Research Laboratories. Facilities for research and for the instruction of graduate students are in the Pharmacy, C.C. Little Science, and W.H. Dow Chemistry buildings. Other Laboratory Facilities. Students of the College use the botany, chemistry, zoology, and physics laboratories of the College of Literature, Science, and the Arts, and the laboratories of the Medical School. Information and Technology Services (ITS) offers many computing and information technology services designed to ensure students' academic success. The University of Michigan’s Albert B. Prescott Chapter of the APhA-ASP, was founded in 1946 and named for the College’s first dean. U-M APhA-ASP members hold joint membership in the APhA, and the Michigan Pharmacists Association. All pharmacy students are eligible for membership. Meetings are held regularly during the academic year. Founded at the University of Michigan, AAPSA focuses on promoting pharmacy awareness and participating in service projects throughout the year. In addition, the organization strives to promote cultural diversity in the College and community. AAPSA frequently coordinates with other professional student organizations from the medical, dental, law, and business schools on campus for both service projects and social events. University of Michigan Health-System Student Pharmacists (UM-HSP) started during the 2008–2009 academic year under the guidance and support of two College of Pharmacy faculty members—James Stevenson, PharmD, and Michael Kraft, PharmD—and several alumni. After the inaugural year of 2009–2010, the organization was recognized by the American Society of Health-System Pharmacists (ASHP) Student Society of Health-System Pharmacy (SSHP). UM-HSP's mission is to prepare the next generation of health-system pharmacists to be leaders by advancing the pharmacy profession. UM-HSP works to establish an organizational framework that enhances collaboration through service projects and delivery of student-relevant information, tools and resources including hospital tours, residency forums, and health-system guest speakers. The organization also addresses the needs of its members through professional and leadership development, career interest education, and other innovative initiatives. The University of Michigan formed the fifth ISPOR student chapter in April 2000. The goal of U-M ISPOR is to increase student knowledge of practices and advances in pharmacoeconomics and health outcomes research from a globalperspective. The student chapter serves as a bridge between students interested in pharmacoeconomics and members of the pharmaceutical industry, health care organizations, government,and academia. ISPOR at the University of Michigan, Ann Arbor is truly multidisciplinary with members drawn from the College of Pharmacy,School of Public Health, School of Medicine, School of Business and the School of Nursing. The PSGC is the College’s official, University-sanctioned pharmacy student government organization. It has primary responsibility for administration of the College of Pharmacy code of conduct. The Council also lobbies for the interests of pharmacy students, shares information about pharmacy and other health concerns with students at U-M and other pharmacy schools, and promotes the education and career needs of pharmacy students. Founded at the University of Michigan in 1883, Phi Delta Chi now has 66 collegiate chapters nationwide. Members perform community service projects, arrange speakers on topics of interest to pharmacy students, and enjoy social fellowship. Phi Delta Chi members meet weekly during the academic year and attend the organization’s annual national convention and biennial grand council meeting. There is also an alumni chapter. SNPhA creates programs to improve the health, educational, and social environment of minorities. SNPhA members develop leadership skills, participate in national health care issues, promote greater exposure of minority health professionals, especially pharmacists, and help provide minority communities with better health care information. At the annual national convention, members attend education and career workshops, develop ties with other students, and help set national SNPhA policy. A student chapter of the AAPS was established at the University of Michigan in 1995. AAPS offers various member services aimed at increasing student awareness of career opportunities, teaching about new advances and discoveries in the pharmaceutical sciences, and nurturing educational and professional advancement.